I’ve always wanted to travel but starting a family early meant that has been out of the question for some time now. I always told the kids that when they turned 18, I would take them to a destination of their choice. Then because I was getting a bit antsy, I lowered the age limit to 16. But I couldn’t even wait that long. In April 2016, I was talking to a friend at work who mentioned she was looking at flights to Japan as Jetstar were having a free return flight sale. I thought this might be the perfect destination for Kate, even though she really wanted to go to South Korea. So, I hopped on the web and ran the numbers. It was doable, the flights would be a little over $600 each including food and baggage. I spoke to Steve about going and before I knew it, I was hitting the booking button. Now, Japan is somewhere that wasn’t on my radar. Of course I have all the fancy places on my bucket list, France, Peru and Vietnam, but I’d never given Japan a second thought. Cue the research, because all I knew was that I’d booked flights to Osaka and that we were going to be there for a total of 13 days. 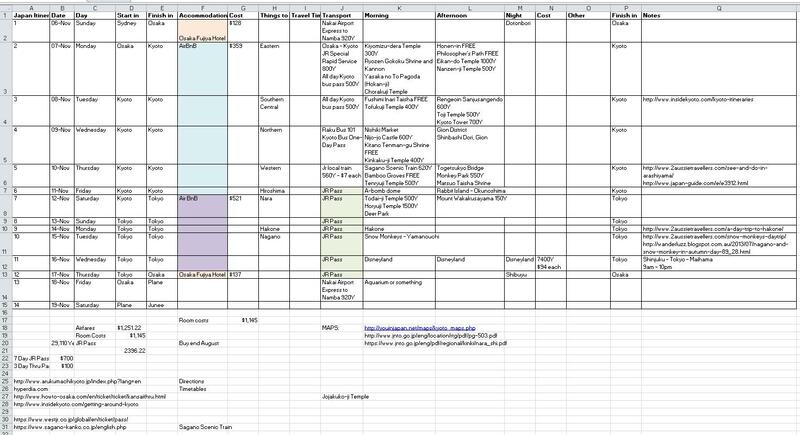 So I set myself up a spreadsheet and got to work. I Googled all the main tourist locations and refined my itinerary just a little bit every time. Kate had some input as to what she would like to see also, but I knew I was travelling with a 15 year old so I had to make it appealing to her also. In the end, she was excited with a lot of the things I had found to see. It was obvious from the start that we would need to book a Shinkansen ticket. The options are for 7, 14 or 21 days. 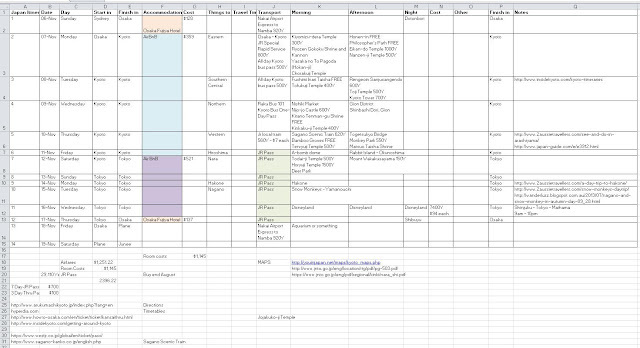 I decided that 7 days was enough and we could build our itinerary around that, knowing that the 7 days needed to be consecutive. 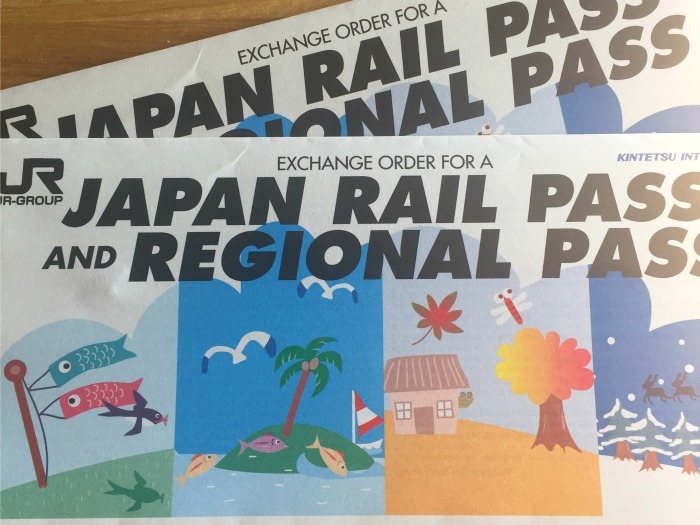 I ordered the tickets from Japan Rail Pass Now and a week later, they arrived in the mail. As you can imagine, working in the rail industry, I was super excited to be going on my first bullet train! I decided to go with AirBNB for most of our accommodation, mostly because I’m a tightass, but also so we could choose a location that was close to the things we wanted to do, or would make our lives easier to get around. Speaking of getting around, the Hyperdia website and app are a must if you are using public transport! So with all this planning, I also decided that I needed to learn a few basic words. I spoke to a friend of mine who’d lived there a while and she thought the best ones to learn would be whatever I could remember along with hello, goodbye, thank you and excuse me. And I must say, these are pretty much all I used too! Now all we needed was the day to roll around so we could fly out and actually get to experience Japan in real life and not just through the screen of my computer!